Two men were shot, one fatally, in the 1300 block of North Sedgwick Avenue about 6:15 p.m. Tuesday, police said. 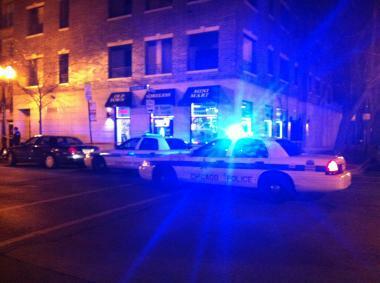 OLD TOWN — A man was shot to death and another was seriously injured in a Tuesday night shooting in Old Town. About 6:15 p.m. Tyshawn Blanton, 31, was shot several times, and a 20-year-old man with him was shot once in the back of the head near a mini-mart in the 1300 block of North Sedgwick Street, police said. Blanton was pronounced dead at Illinois Masonic Medical Center at 7:05 p.m., according to the Cook County Medical Examiner's office. The 20-year-old man was in serious-to-critical condition at John H. Stroger Jr. Hospital, a Chicago Fire Department spokesman said. Blanton's older sister, Taza Blanton, was at the scene Tuesday night. "Right now, I don't know anything," Blanton, 39, said. "He’s a father of three. What can I say? He's my little brother." One Old Town resident had a grim take on the violence plaguing parts of the city. "There is war in Chicago," said the woman, who asked not to be named. "It’s pouring into this neighborhood from the South and West Sides." The Old Town mother of two said she worried about growing violence in the neighborhood. She said she wanted more police officers to take up residence there. "We need more officers that live in this neighborhood," the woman said. "Then they'll care because they live here." Blanton was the city's second homicide on Tuesday. A man was shot dead earlier in West Garfield Park.